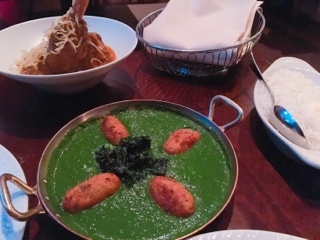 As soon as I entered Junoon’s swanky Patiala dining room, I knew this dinner would be different from past Indian meals. I couldn’t help but chuckle after settling into the plush velvet chair and taking in the ornate surroundings - Junoon describes the Patiala room as the area free of tablecloths providing relaxed service. Sure, the tables are free from linens, but the attentive service and swapping of cutlery between courses isn’t your run-of-the-mill relaxed family restaurant. At first, the ‘ghost pepper’ description in the murgh tikka ($23) had us worried – should I order a mango lassi to have on hand, just in case? Luckily, the chili wasn’t too strong, although you could taste it in the background, even with the chicken’s skin removed. The bare meat was flavourful and juicy, great on its own or with a smear of the pistacho purée. 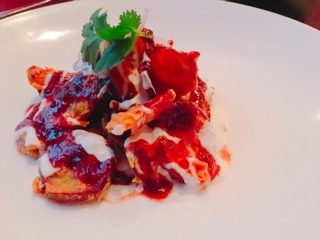 To combat the spiciness, I suggest ordering the eggplant chaat ($15): the heavy drizzles of raita and tamarind chutney really helps calm any heat. Moreover, chaat, traditionally a street food, is rather plain on its own. However, when the chicken and deep fried circles of battered eggplant are combined, they do come together rather nicely. 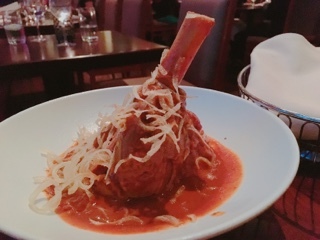 The shahi lamb shank ($36) arrives standing in its full glory. The sous vide lamb is soft and succulent, while the black cumin yoghurt curry mixed with garam masala is flavourful without completely covering the meat … I had my fair share of the gravy spooned onto pulao rice ($6). What a deliciously hearty main. Junoon is great for those who want flavourful Indian dishes without spiciness. Although I enjoy heat, sometimes the sheer amount of chilies added into sauces become too much and leaves the tongue scorched and numb. Junoon applies more complex flavours - one visit to their basement and you’ll find an entire room filled with jars of spices combined for seasoning dishes. Even a simple garlic naan ($7) is unlike any other – you can actually taste the herb, it’s like eating garlic bread in naan form. Trust me, try the hara paneer kofta ($23) and dig in as soon as it arrives. The hot crispy paneer dumplings are something else: break into the soft crumbly centre and a fragrant cheese aroma is emitted. 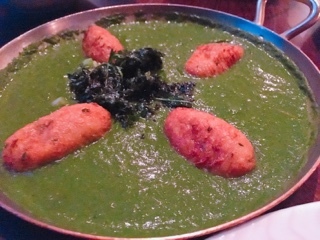 Meanwhile, the green chili spinach (?) purée is neutral enough against the mild soft paneer. If only there were more of the crispy mustard greens, wow do these add a pop of flavour! At first, I had doubts about Junoon’s authenticity. When first seated for our 7:45pm reservation, the dining room was only about 70% filled and it was a pretty diverse crowd. 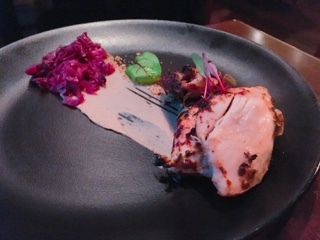 It wasn’t until later, towards the end of the meal (around 9:00), the room filled to capacity and my husband and I became the only non-Indian diners at the restaurant. Still, it was the eavesdropping on a neighbouring table that truly confirmed Junoon’s legitimacy. As a son cautiously asks his parents if the food was okay, the mother looks up from her plate and enthusiastically nods while the father chimes it that it’s good. So, if my word isn’t enough, then trust these strangers.